Another cold night to come, heightened by the fact we’ve realised why the second gas bottle wasn’t working properly: it’s empty! A cold meal of bread, oil, tomatoes, cheese and olives washed down by cold peppermint tea, countered by the fact we’re back on the Yorkshire Dales and in a much quieter spot than the previous night, thirty yards away from the little road that rises over Nidderdale from Grassington to Pateley Bridge. We wandered around Bolton Abbey before climbing Nidderdale, a beautiful end to what had been at times a frustrating day. Getting lost hadn’t helped, and nor had going to the wrong Overton, which was around one hundred miles away from the Overton we should have gone to. I checked in the Road Atlas, which has started to fall to bits, and there were eight different ones, so perhaps I can be slightly excused. But that doesn’t matter anymore because we’re here, on top of the Dale. It’s cold tonight, very cold, the coldest it’s been so far. And it’s darker than I can remember too, with no light pollution whatsoever. “It’s harder to work out the constellations when there are so many stars in the sky,” says Paul. I look up and the night sky is absolutely full of them. But our amazement is buffeted by the freezing wind we’re sheltering from. Even standing on the other side of the van doesn’t stop us shuddering constantly, as the wind comes flying underneath and finds its way up our flapping trouser legs. We awake to reasonable warmth and that comedy song again. I open the blinds and watch them playing on the moor, dipping and diving, singing their beautiful up and down comedy song. And I wonder if they are lapwings, but I always struggle to recognise a lapwing until it lands and its head crest stands to attention. After coffee, Paul and I walk up a path to a nearby small tower. It’s a lime-kiln furnace, built around 1860. Large pieces of limestone were hewed from quarry, then broken into fist-sized pieces for the furnace. Lime was produced by heating the rocks in excess of 800 ° C. This lime-kiln was designed to feed the Victorian need for huge volumes of lime – essential for both building mortar and as a fertiliser. Then we walk up the hill to our right. A sign says there’s a piece of contemporary art up there called Coldstones Cut, a modern viewing sculpture that looks over a newer quarry. 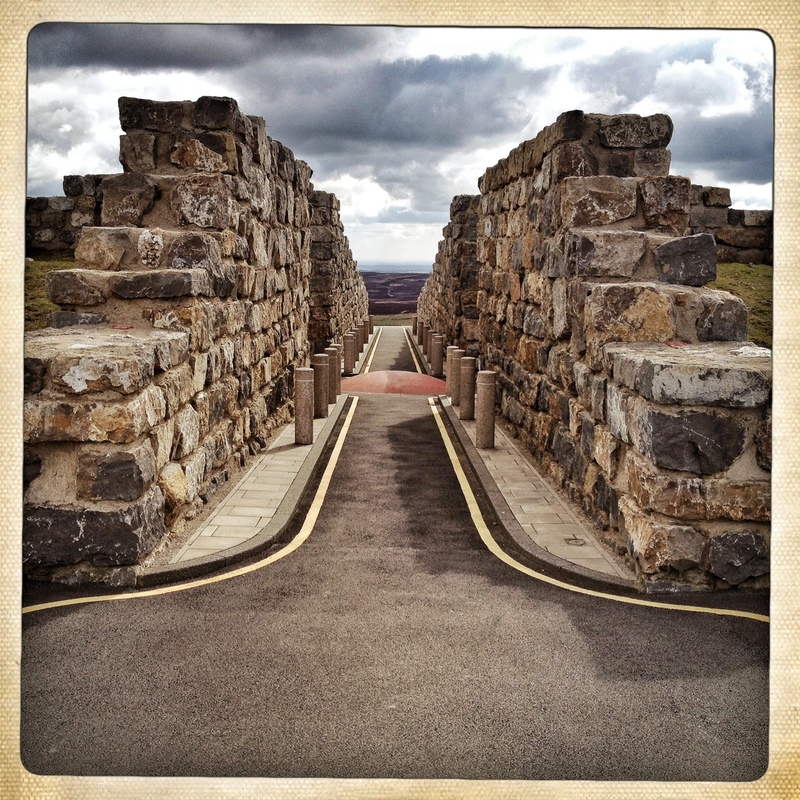 We wander up the track, legs aching, then arrive on top and walk between two looming walls of limestone, smile at the yellow lines and bollards on either side of the tarmacked small lane that goes between the walls, climb over a little red roundabout and look ahead to nothing. The lane travels slightly uphill so all we can see is the sky. In fact it feels as if the lane simply stops at the end of the earth. Forwards we go, ignoring spiralling paths on our left and right, until we stand there, on the viewing platform, and look down upon a huge working quarry. The ancients, even the Angles pre-Christianisation, the Vikings too perhaps; they would have been appalled at this gouging out of mother earth, at least two hundred metres deep and two hundred metres wide. 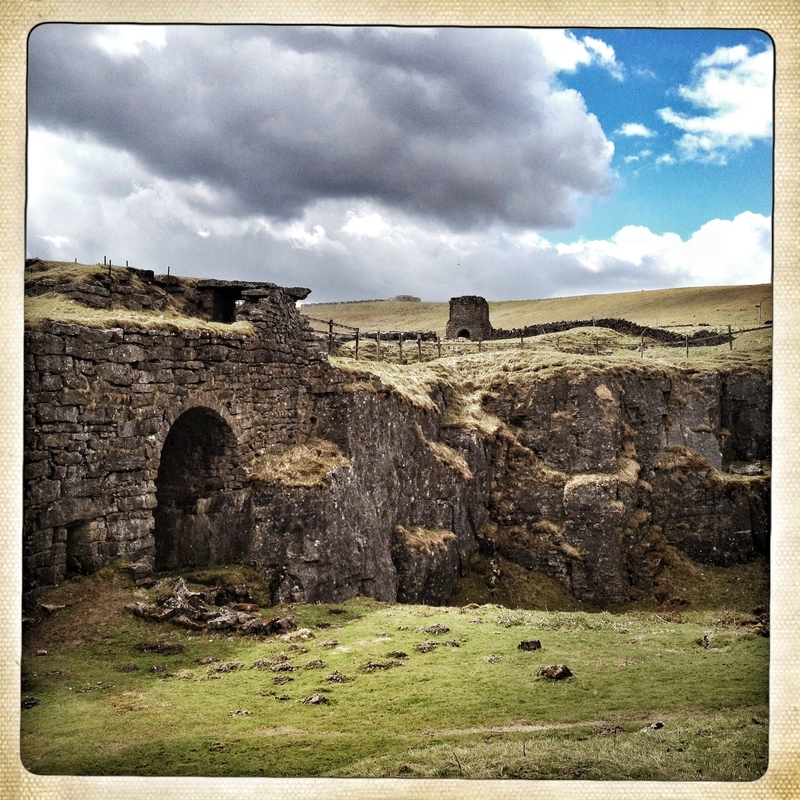 If the Roman roads cutting through hills and dales could unleash spirits from the underworld, then this giant hole would descend right into the depths of hell itself. We stand aghast, amazed that this is here, just six hundred metres up the hill and we never knew, never even heard because the sound is swallowed up in itself below the surface. 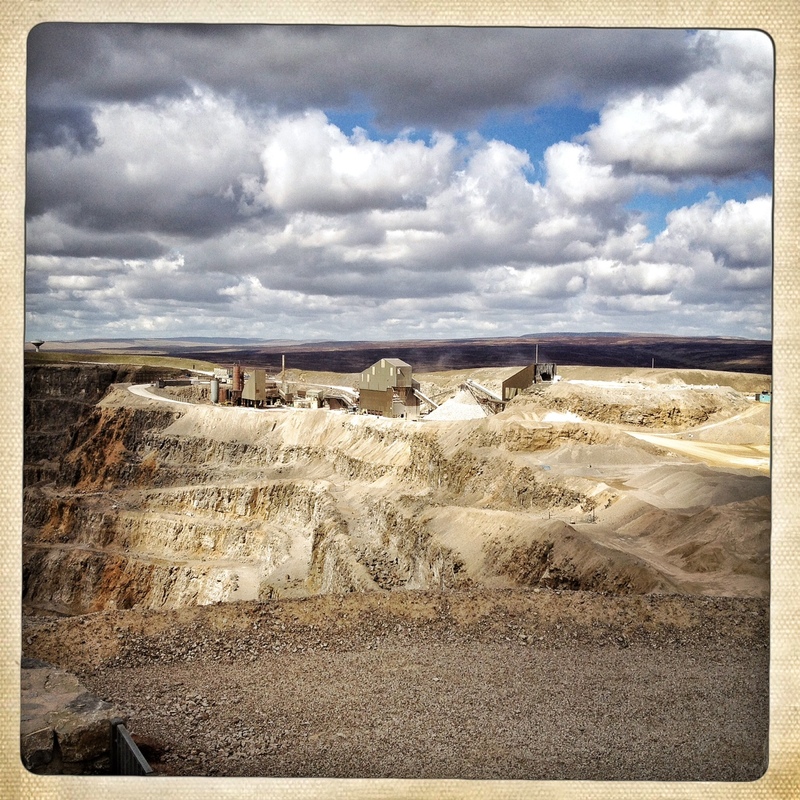 We climb those spiralled paths and reach higher rounded viewing platforms, look down on trucks below, little tonka toys that drive around the ridged spirals of the quarry, deeper and deeper inside the earth. Grabbing pulling, digging and carrying back to the buildings perched right on the edge at the top, where the limestone is converted to lime in much more effective and quicker methods than back down below in the Victorian way. And then we spin slowly for our 360 ° view: the quarry in its context; the Yorkshire Dales, green in some places, heathered in others, Pateley Bridge down in the valley and the giant golf balls of RAF Menwith Hill away to our South East. 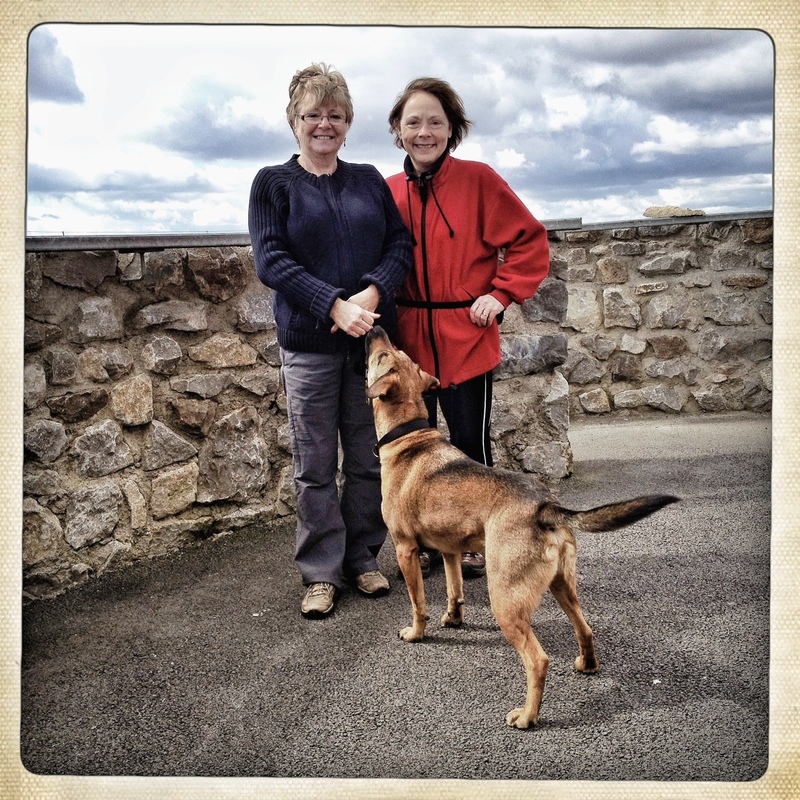 We meet two lovely ladies up there; Sue Smith and Lesley Cooke, with Lesley’s dog Eddie. They are on their way to Grimwith Reservoir, but stopped off along the way because Sue, who moved up to the Dales from Manchester in 2010 with her husband, has never been up here. She describes it as looking Egyptian but being from Yorkshire, this contemporary art that was built the same year she moved up here. Lesley’s a teacher who takes female students from the Bangladeshi community of Bradford into the dales to complete their Duke of Edinburgh Award. It’s where her dog gets his name from. The girls are from rural communities in Bangladesh and they move to Bradford and often try to maintain their rural belief and way of life, something which obviously can be a struggle in a city in a different country. Taking them into the country must give them some quiet, some time to process their new life, work things out back down below, return with renewed confidence. Sue and Lesley are pleased they will feature in our work and are genuinely interested in our journey and the travels of the Community of St Cuthbert. They leave with warm handshakes and Paul and I walk around the circular sign that points out directions and distances around the world. Liverpool is 106.5 km away, whilst Buenos Aires, in the same direction, is 11,210.6 km away. Machu Picchu and Lytham St Annes are in the same direction too, 9957.9 km and 246.5 km respectively. Workington, Cockermouth and the Sioux Falls are away to the North West. Lindisfarne is 176 km away to the North, Durham Cathedral, our final destination, 79 km away. Back down we walk. A lapwing chases a crow with a flap of the wings and a steep dive, and I wonder if this comical noise is that of a lapwing in flight. But if so – why haven’t I heard it back home in the dene at the bottom of our street? I called my fledgling publishing company Lapwing Books, because Lapwings for me represent freedom . But ever since I set up that publishing company, to design and release my memoir ‘Andalucía’ and ‘Shattered Images and Building Bridges’ – a collection of writing and artwork from the three Durham prisons I’ve taught creative writing in, the lapwings have disappeared. Like many birds their numbers are declining, but there’s still a good few out here, and they’re as vocal and beautiful as ever. Down in Pateley Bridge, we’re told we can buy a new gas bottle from the coal yard. Out comes a friendly gentleman in his sixties and we get talking whilst I use a spanner to remove the empty gas bottle. 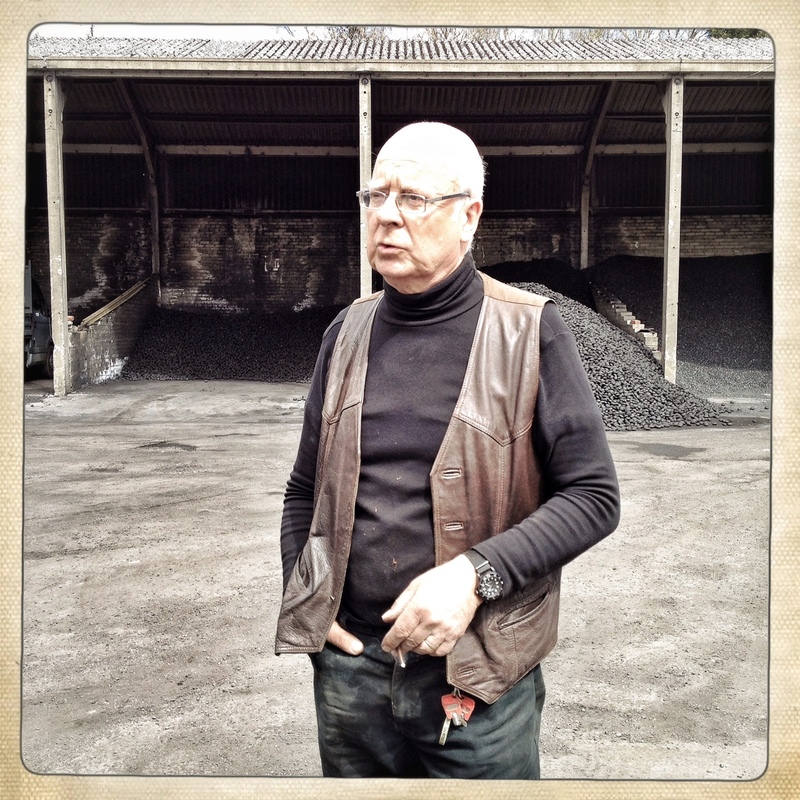 “How long have you been working here then?” I ask him, looking around at the mounds of coal. I hand him the empty gas bottle, take a full one from him in exchange, smile. “Aye, I’m going to die,” he says. I smile again, a little unsure of myself now. And so, presuming the sale goes through, he’s off to Majorca for a week with the whole family, his children and grandchildren, and then he’s returning to England to pass away. “You look as fit as a fiddle,” I tell him. Roger Hawkesworth is his name. His coal yard used to be a railway station before his grandfather bought it. He points to the top of Nidderdale. Paul talks to him about coal, given his upbringing in a County Durham pit village and his early memories of the strike and the lines of blockading police that were sent in. Roger’s memories of the eighties are quite different. He went down to Nottingham each night to break the picket line. “Not like Easington where I’m from then,” says Paul. Station Garage, as it’s called, shifts two thousand tonnes of coal every year, all for domestic use. Roger bids us goodbye, tells us all the playground equipment in the village was donated by Hull because the Hull kids were evacuated here during the Second World War. And then we’re off again, back on our journey, this time to York, as Peaseholme Green, once a water meadow just outside the walled city, is on our list of places the Community of St Cuthbert stopped at. We drive through the centre of York and park for free in Carpet Right’s car park, then walk towards the Church of St Cuthbert, wondering if the Community would really have dared to venture so very close to Jorvik, the Viking capital of England. There’s no sign outside the church and it looks as if it hasn’t been used in years, although there is a bicycle rack by the side of the front door. Access to gravestones around the back is blocked by a padlocked gate and fence on either side, strewn with nettles, a tipped over bin and empty cider bottles. From earlier research, I’d read that this church has been bought by Visions Multimedia Worship, a “Christian spirituality that mixes ancient and future technology and prayer, vibrant multi-sensory experience and creativity.” Suffice to say, this is all something of an anti-climax. People queuing for the bus opposite watch us wander around the front lawn of this dilapidated church and try without success to open the door. If Visions Multimedia Worship really do own this place, and if anything actually does happen inside, then they’re not doing much of a job in telling anyone else about it. Along the city walls we walk, new apartments on one side, early rush hour traffic on the other. Down and past the Minster and St Wilfrid’s Catholic Church, its ornate and elaborate front reflecting the accusations of pomp and circumstance levelled at Wilfrid himself. I’m dragging Paul to the train station, not physically, but it’s fair to say he prefers the quiet villages we’ve been travelling to and the amount of people surrounding us here, while not overpowering like London or another major city, is a little unsettling after spending so much time in the countryside. But this is York, and this is Jorvik, Viking capital of the country when the Community of St Cuthbert were on their seven year wandering. And Jorvik was a place of hustle and bustle, of barter and business, of specialist craftsmen and traders from all over northern Europe. Although nearly 38 miles from the coast, Jorvik was accessible from the North Sea via the Humber Estuary and the River Ouse. Perfectly situated towards the middle of the country, it was already a well-established political, religious and commercial centre and still retained its defensible Roman walls. These days York, recently voted one of the best medieval towns in the world, is reached by car and train rather than river, and that’s why I want to go to the train station, to get a feel of people coming and going from all over the world. Starbucks, Whistlestop, WH Smiths, the obligatory pub, Upper Crust, Burger King, Pumpkin Café, Costa Coffee; it all seems drearily familiar to the casual rail user like myself. I’ve just started to write when an old woman walks up to us, though she’s not as old as she first looks when she gets up close, is probably still in her forties. And then she talks to us, for about five minutes or more, non-stop. But I can only understand a few phrases, she talks so fast. She’s coming to the station for a drink of water. Her boyfriend worked in a chocolate factory for nineteen years and they’ve got nothing now, ‘not even a sausage.’ She slapped him the other day but I couldn’t understand what for. 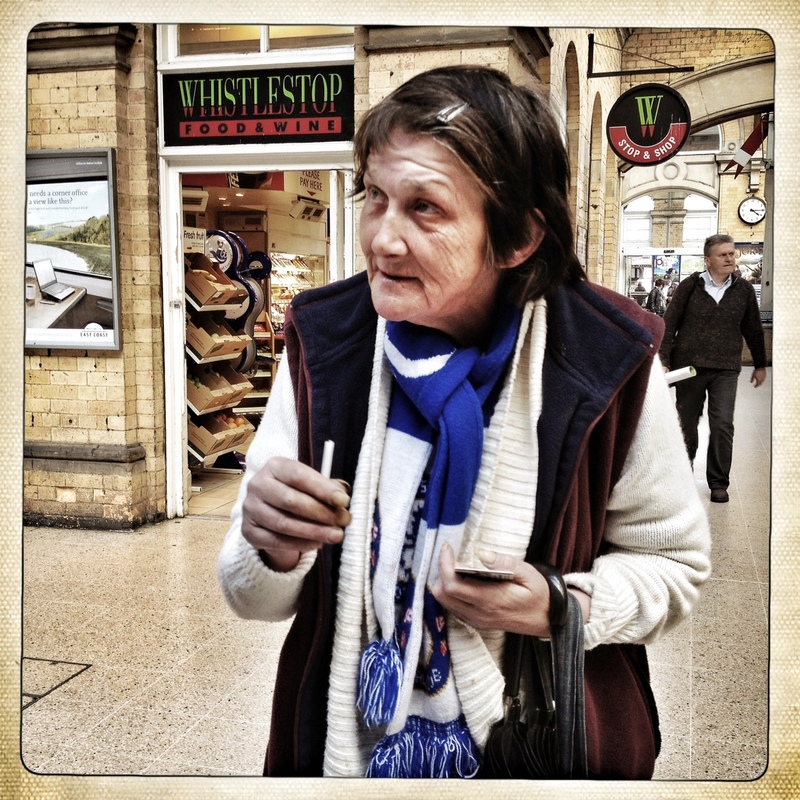 Paul rolls her a cigarette and I give her a pound for ‘a cup of coffee’. She shakes our hands and says “Bless you.” Her hands are freezing cold, the skin around her wrists cracked and blue, her nails curved yellow talons. She wanders off and I look around once more; British Transport Police, commuters, girls on phones to boyfriends, anxious looks on their faces, girls on phones to boyfriends, cheeky grins on their faces, boys with ankle length trousers and trendy plimsolls, a woman in a burka with jeans and trainers, Japanese tourists and Chinese students. Sudden shuffling and grunting with cases; the 16.29 to London Kings Cross is here. We walk back to the van via the river, wide and free. I imagine boats coming from all over Northern Europe, with goods from all over the world to sell; spices and silks from the east, amber, whalebone and walrus ivory from the North Atlantic, soapstone and sharpening stones, furs and fish. About twenty young children are running amok, some with wooden knives and swords, while their mums sit smiling on a bench. “Die Anglo-Saxon,” one of them shouts. Another holds a knife up to his mother’s neck. “Are you Anglo-Saxon?” he demands. 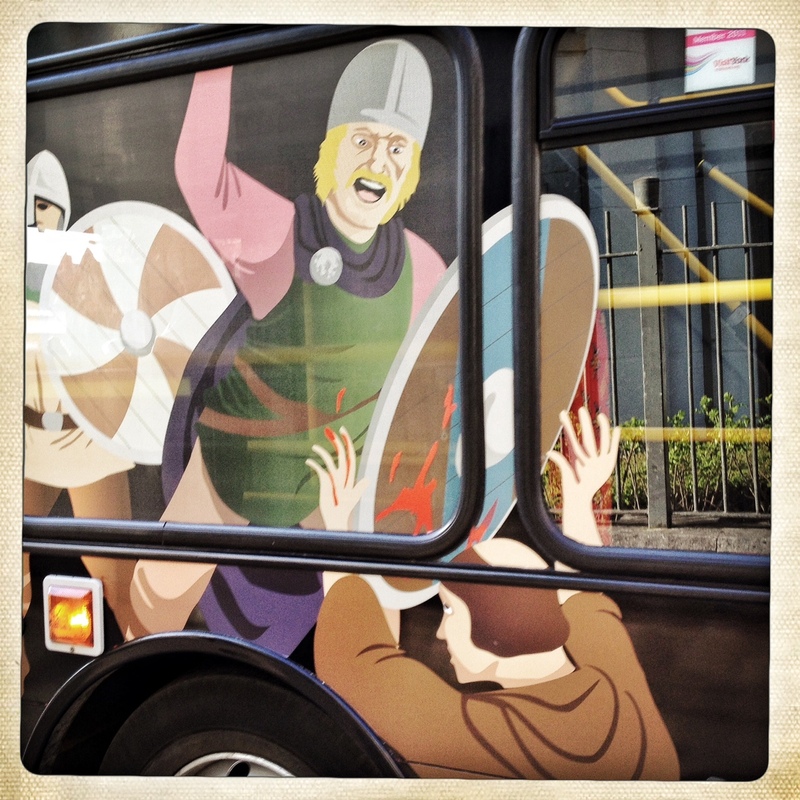 I’m guessing they came from the Jorvik museum, in this city that celebrates the fact it was conquered by the Vikings. What an adventure you two are having. I hope the quarry didn’t unleash any spirits from the underworld; but, if it did perhaps they would have shared a hot cup of tea with you that cold night. Hopefully you have a heavy jacket to keep you warm. Paul’s photographs are wonderful and all the people you are meeting are interesting characters. Thank you Heather. Thank you very much. More to come over the coming days, weeks and months…. I am Rodger Hawkesworth’s sister I live in Florida, USA (married an American 43 years ago.) Just wanted to comment that I enjoyed the conversation you had with him. He really is a fountain of information on the local history and will be greatly missed by so many. Rodger has been with us longer than the doctors had indicated but he is failing now and I will be leaving for England shortly to be with him and our Mother. I just wanted you to know that you were one of the fortunate people to meet him, if only briefly. Hello Irene, and thanks so much for your graceful comments. We only went there to get a new gas canister – but we stayed about half an hour to chat. Your brother told us about the history of the place, his amateur dramatics, working during the miners strike. He was very interesting and had a real quality of calmness about him, as if he had accepted what life had in store and appreciated the people he had, the places he’d been and the things he’d done. It was a pleasure to spend some time with him. His picture has been up at our exhibition, as well as a picture of the coal-yard. And I know it’s had an impact upon people because they’ve told me so. I think reading about someone else’s mortality helps us consider our own, the things we’ve done and the things we still need to do before our time is called. Irene, I thank you for letting me know. I was at my father -in-law’s memorial service last weekend, like Rodger, another great man with a great tribute. Take lots of care and thanks again.. This entry was posted on May 3, 2013 by richardwhardwick2013 in Blogs by Richard W Hardwick.